BAROQUE Fall/Winter 2019 collection review. 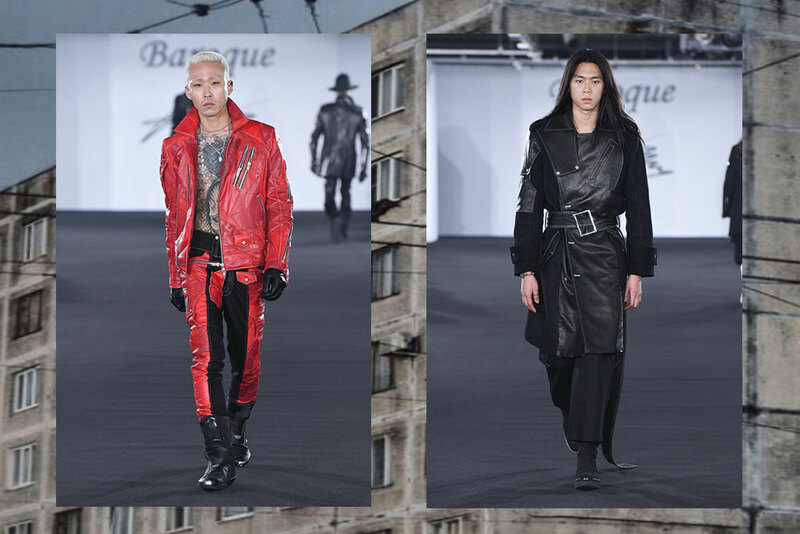 If you have never heard about BAROQUE, you should start paying attention to this young brand. BAROQUE is known for their preference for the monochrome gothic style, and one of designer DOYEON LEE’s main muses and runway stars was model and tattooist KIM WOO YEONG (@marleyhong) who passed away in a motorcycle collision early November 2018. The Fall/Winter 2019 show was an homage to the late model. Indeed, the show began and ended with video montages dedicated to Marley Hong, who used to open and close BAROQUE shows since the brand’s climb to the DDP stage. This season the show opened with a model wearing a red and black leather trouser and a white flag over his shoulder, and we should remember that white is the color of mourning in South Korea. A strong showing of various Biker looks followed, and monochrome color outfits backed with colorful zipper details further made and impression. Numerous were the head-to-toe black looks, leather pieces and long black coats. This season BAROQUE struck hard and steeped us in a world of melancholy and nostalgia.